Below is a small sample of actual comments from customers who took the time to write to us. Visit our showroom and ask to see the complete folder! Your staff is terrific, and they make sure you get what you want. They were all very helpful and care about people and workmanship. GMT makes sure the customer is happy. I’ve received lots of compliments on my new kitchen island and I just love the character the antique finish of the surface adds to my home. I wish I had another project for GMT! I wanted to take a minute to let you know how great the granite looks. 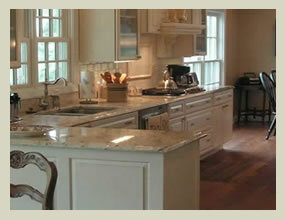 The kitchen stone is beautiful (bathroom too) – although it puts my cabinets to shame!! After seeing how the island was laid out, I believe I now have a better understanding of what you see when you are looking at the slab. I remember you mentioning that the nice splash of lighter color, which was more dynamic, would look great on the island – and it does. So I guess I can say that I’ve learned a lot during this adventure. As far as the install, here are the major points I noticed. The coverings on the floor – from the entrance point all the way through, nice touch! Clean up – both inside and in the garage – again, nice touch. The install team was friendly, professional, respectful, and did a great job. Thanks to you and the team!! Just wanted to send you a message to let you know how much we are enjoying our new countertops. They look great and we have received a lot of compliments on them. Everyone we worked with at GMT made the process very easy and we would definitely recommend you to anyone we know. Thanks! I just want to say thank you. Our granite countertops are absolutely more beautiful than we had even dreamed. We love how you laid out the cuts to enhance the beautiful swirl of the granite, and how each section flows the same direction. The island is gorgeous! I’m especially thankful for your expertise in discovering the granite’s flaws and that GMT was able to negotiate a sale on our behalf. We enjoyed the entire process, from the selection to their installation. Please let everyone on the GMT team know how pleased we are with the finished product. To all the guys we didn’t meet, thanks for the beautiful work! GMT is awesome. We look forward to completing our remaining projects with you. Thank you for doing such a fine job for our customer. We enjoyed working with you and hope to steer some more work your way. Thank you for your professional work on our island counter! – Dr. S.Z. Shah, M.D. I want to thank you for all your consideration with the Albrecht job. The customer has decided to finish the backsplash with a third option outside Creative Home. This project has been a real learning experience and I am very happy with the work and product that GMT provided. I hope that we can continue to work on projects together in the future. Thanks again! Thanks GMT. Your staff did a fabulous job on the granite countertops! Thanks. The countertops look gorgeous! Thanks! We absolutely love the new granite countertops! Our customers are very, very pleased and said the guys clean up after themselves very well which is important to me. Please share this with all the guys at GMT. As always, great job! Another happy customer! Thanks for doing such a great job on our kitchen. We are very pleased. We will recommend your business without hesitation – and if we redo anything, we’ll be sure to call you first. Beautiful work on our fireplace surround! Thanks for doing such a great job on our new countertops! Great job on our new granite countertops. Thanks! Everything looks very nice. We hope this job will help bring some other jobs your way. We love the look of our new granite! What a beautiful addition to our home. Thanks for all your great work. Please thank the guys who were here working – they did a super job. We love the granite that was installed in our home, and your employees are excellent and most professional. Thanks so much for everything. You guys are the best. My granite is perfect! Thank you so very much for making our granite installation so positive. You turned a bad situation around. We are especially thankful for you going the extra steps of finding the matching granite. We feel like we won the lottery! You style, professionalism and skill really help when we needed it. We really enjoyed working with you. Thank you for the excellent craftsmanship. You staff is top notch – true craftsman from the shop to the install … something not often seen in this day and age. Thanks for a great job. Just wanted to say a big thank you! You have done an awesome job. We really love it and will give your name to anyone and everyone who asks. Not only is the work great, but all of you are so easy to work with. Thanks again. Said it before … say it again: They did a great job and we’re very happy with the results. Thank you. We would be honored to help you write a success story for your next project.